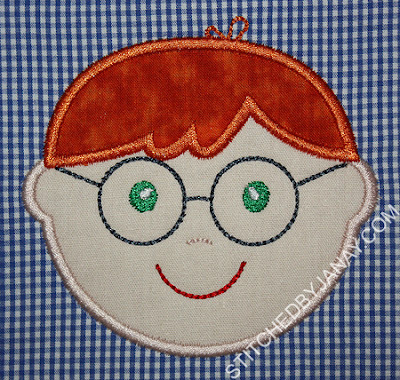 This was made completely in my embroidery machine (with the exception of one small opening I had to whip stitch shut by hand). 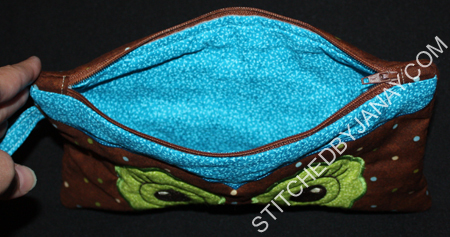 It has a zipper, and is completely lined with no exposed seams. 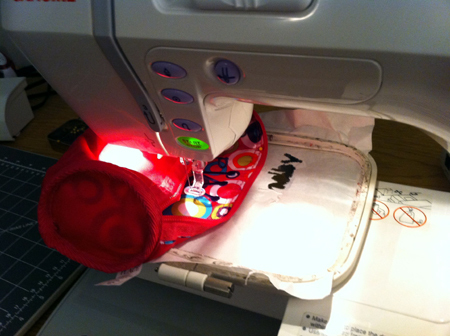 There were multiple reasons I decided to take the month of August off (travel and back to school primarily) but another major factor was I knew I was getting another hand-me-down embroidery machine, so I had to spend quite a bit of time in my sewing area preparing for it's arrival and then setting it up! 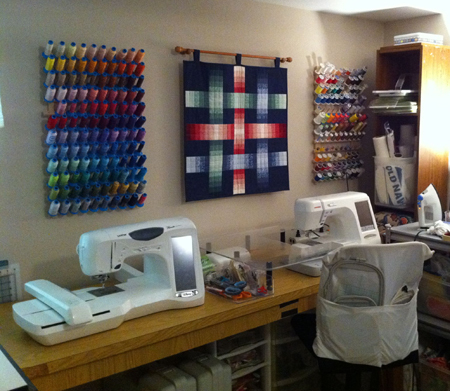 I've been asked several times to show pictures of my sewing studio. I'm not sure a complete tour/reveal will ever happen. :) I do not have a dedicated room for my craft, just a section of our master bedroom, so there is a lot of stuff crammed into a small amount of space. And unfortunately it is usually a mess. I've worked quite a bit this month on reorganizing to make room for the new machine and make everything more user-friendly, but I still have a LONG way to go. Thanks to my husband giving up his table, I do have a nice sturdy surface to have both machines side by side. YAY! I really didn't think I'd be able to have both set up simultaneously. This is very exciting! 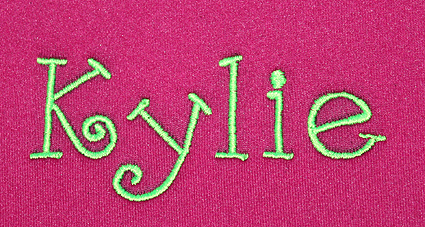 I used Embroidery Boutique's Double Fun Alphabet (zigzag stitch). I just used the outside part of the letters, did some significant resizing, and adjusted the pull compensation to widen the zigzag. 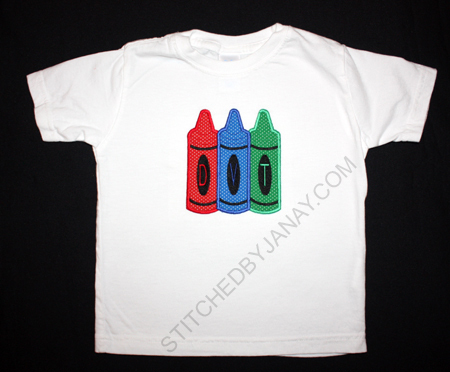 It stitched beautifully and it was so neat to make such a wide design -- perfect for an adult shirt! We've been home for over 2 weeks, but life has been so crazy (with travel recovery and back to school) that I just got my new-to-me Brother ULT2003D set up this afternoon! I only had a two hour window during my son's nap to play, so I decided to make myself a new key fob, again using the full extend of the 6x10 hoop! 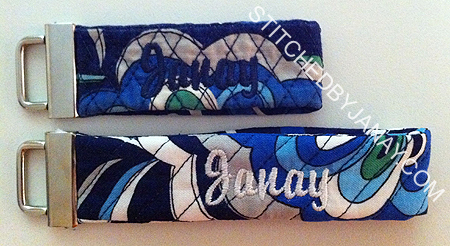 The in-hoop key fobs are from DigiStitches. 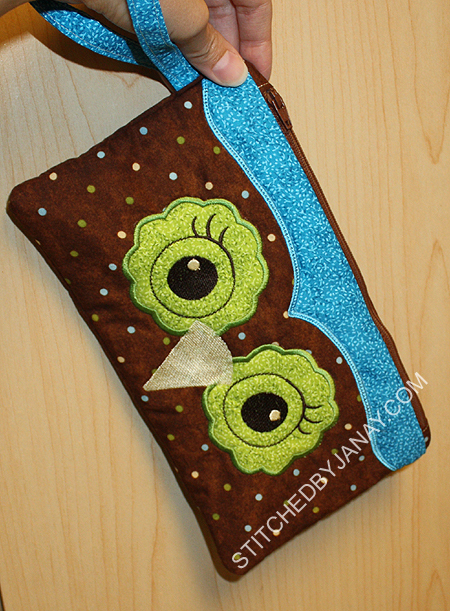 I added my name with Embird Alphabet #7. 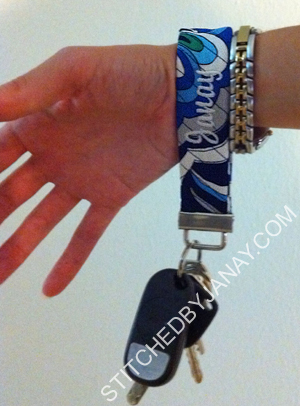 The top one is the key fob I made myself in March, and the bottom is the one I made today! It's amazing what a difference a couple extra inches can make. Now it's big enough to slip around my wrist! 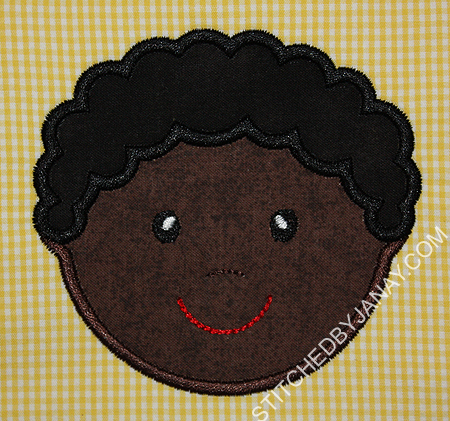 I had so much fun picking fabrics for hair and skin. I tried to create as diverse a set of faces as possible! I used 5 different skin fabrics, five different hair fabrics, and six different threads for eye color. 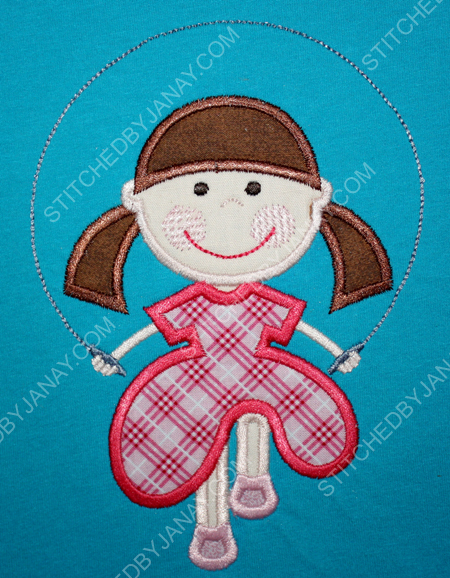 I also decided to stitch them on my new gingham fabric (purchased from a pre-order from Whimsical Fabrics). 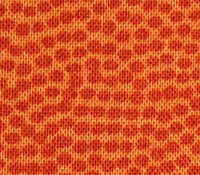 Right now these are 9x9" squares... 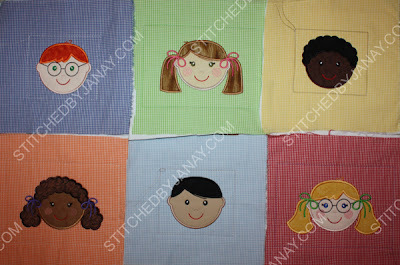 I hope to turn them into a quilted wall hanging... soonish. 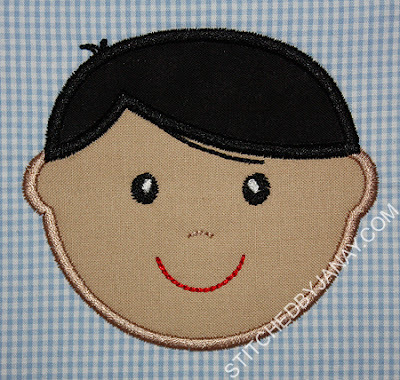 The faces come in four sizes. I chose the 4x4 boys and the small 5x7 girls. Their faces are proportional to each other, but since the girls have ponytails, their overall size is bigger. I'll keep you posted on my progress when it comes to combining them into a wall hanging. I'd love to include the lyrics, "Red and yellow, black and white, they are precious in his sight, Jesus loves the little children of the world." 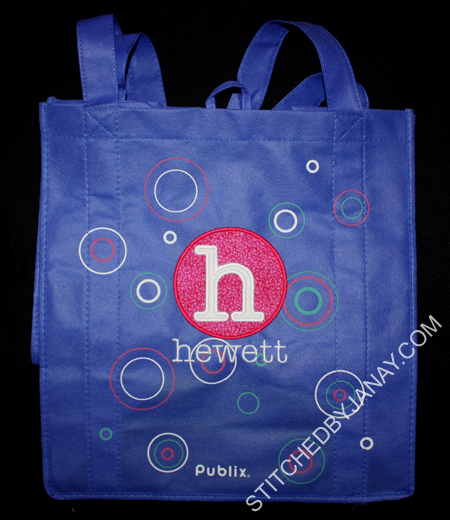 BUT that is a lot of text to embroider! Not sure... Any suggestions?!? I loved to jump rope when I was little. I remember doing "Jump Rope for Heart" events in elementary school. So when I saw this design, I just loved it. 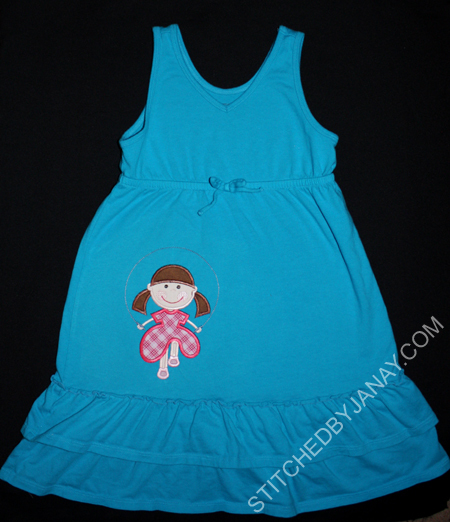 Thankfully Annaliese did, too, so we put it on a little sundress for her! This dress had been sitting around for several weeks. We had another design picked out (fabrics selected and everything) but I had been busy filling orders and hadn't gotten to it yet. So glad I waited, this is precious. Annaliese loves it! 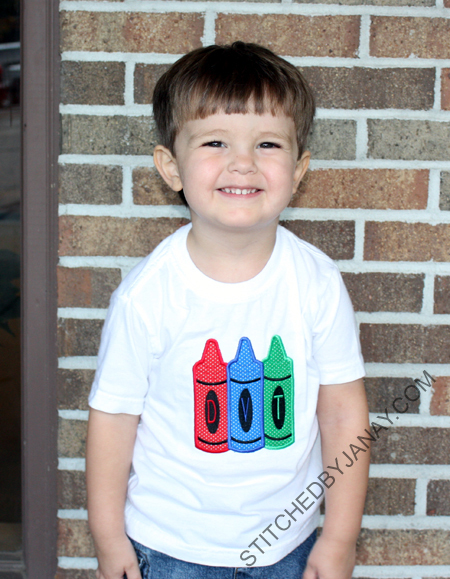 Yesterday was Dashiell's first day of preschool! 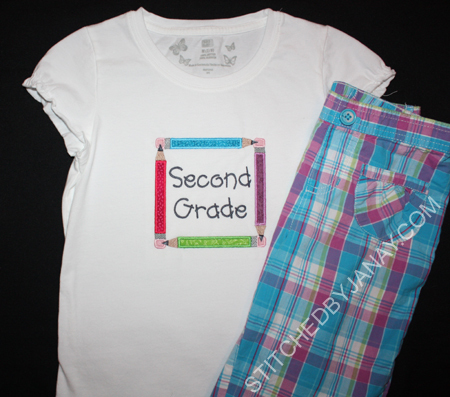 As I was stitching Annaliese's back-to-school shirt, I received a design to test for 8 Claws and a Paw Embroidery. When I took a peek, it dawned on me that I hadn't given a single thought to poor Dashiell and what he would wear on his first day of preschool! 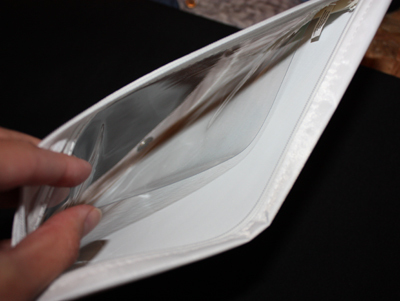 I'm so thankful that this design was a PERFECT solution, and got it done the next day! 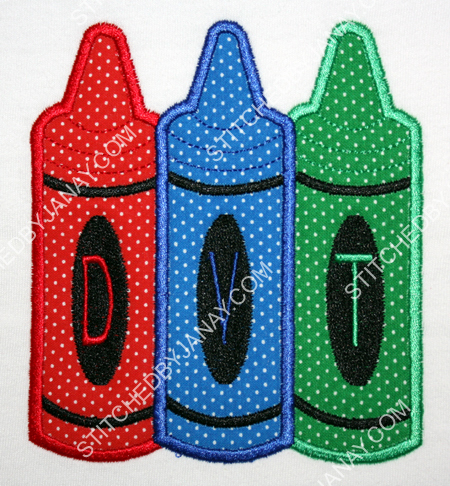 The Crayon Trio applique design and the Skinny font (which I used to add his initials) are both from 8 Claws and a Paw. 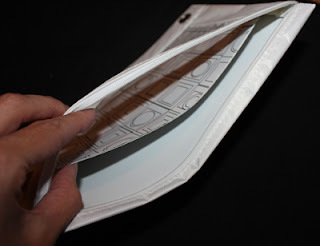 Actually, I think the font is included with the design purchase, bonus! 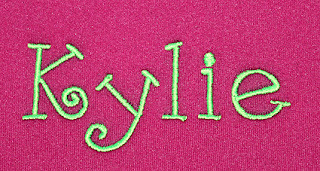 I used the Taylor font from Lynnie Pinnie. 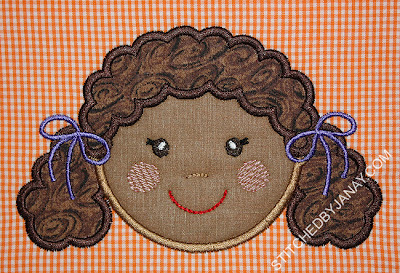 And hey, 8 Claws and a Paw has released a lot of new applique designs recently -- go check them out! So the Sunday before school started I actually braved Walmart at 12:30pm. Annaliese and I darted in hand-in-hand to get to the school supply aisle and get out. She had picked green (her new favorite color?!?) 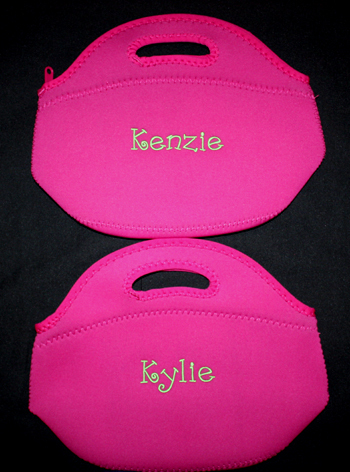 for all of her supplies and really wanted a green bag. I warned her ahead of time that it may be slim pickin's at this point and she couldn't be choosy. We saw one bag that had robots on it (uh, no) and headed to another aisle. 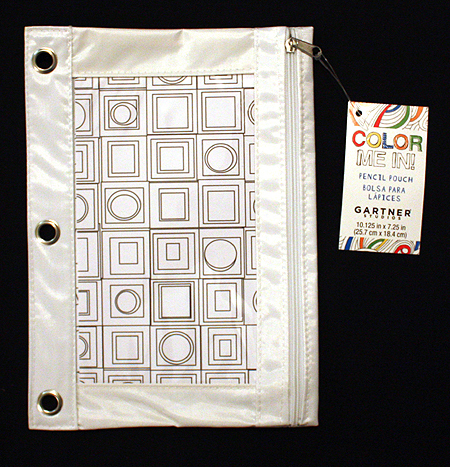 I saw some white bags and figured that would have to do, and then noticed it said, "Color Me In". and exclaimed, "Annaliese! 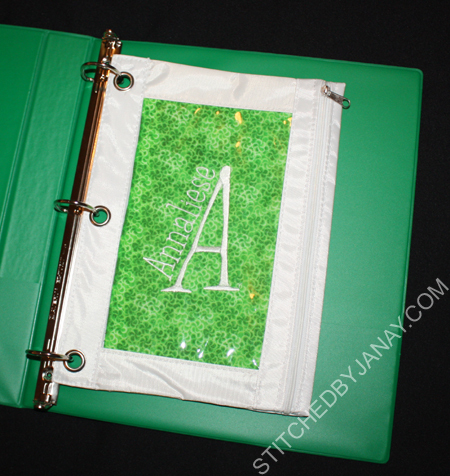 You can pick green fabric, I can monogram it and slip it in!!" 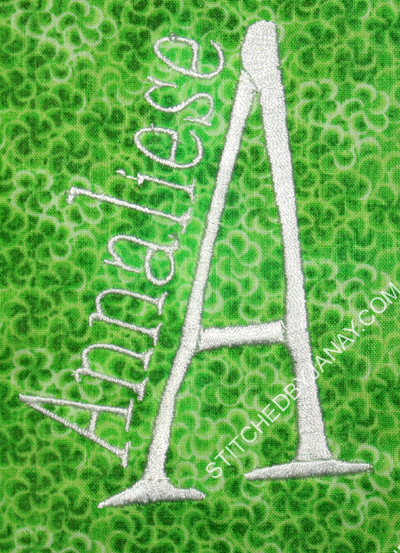 Annaliese picked the fabric, and I created the monogram. I used the new Riddles font from 8 Claws and a Paw. I thought this was a good solution to get a very long name to fill the vertical space. And Voila! 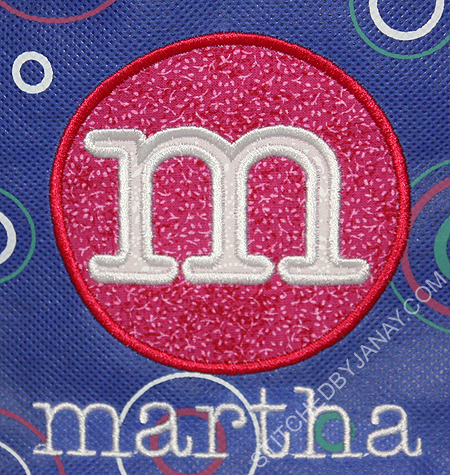 A monogrammed pencil pouch with no funky hooping. Cool, huh? Today is Annaliese's first day of Second Grade! Can you believe it?!? 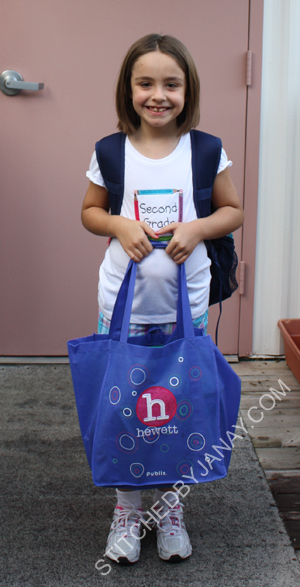 Shortly after getting my embroidery machine she headed off to preschool. A couple years later was kindergarten, then first grade... wow! Time flies. Sniff, sniff, I should NOT be looking at all these old posts right now; it's hard to type with misty eyes. 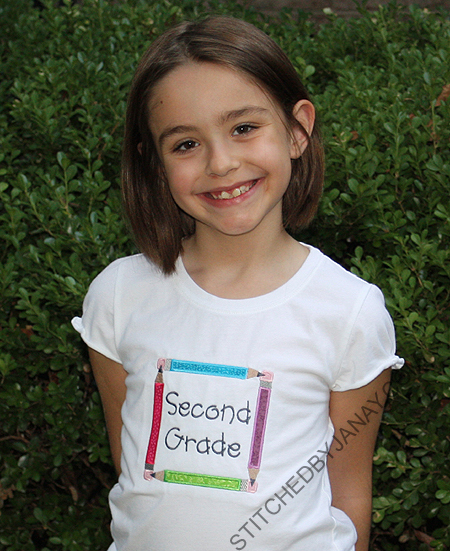 Here's my girl, ready for second grade! Neither Annaliese nor I had a clear vision for what should go on her shirt this year, so we sat down on the couch together with my lap top and browsed designs. 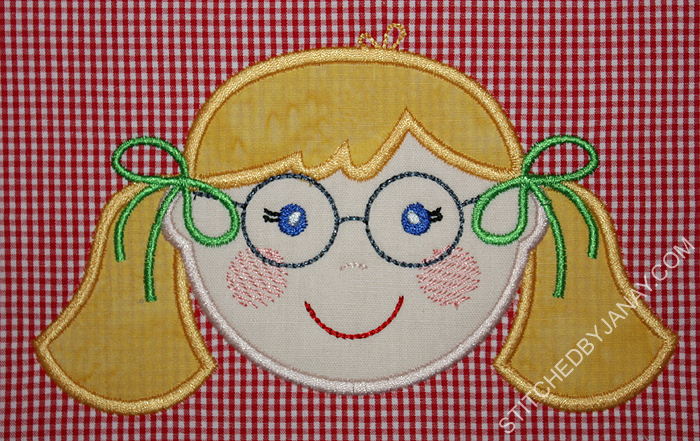 We settled on the Pencil Frame from Applique Corner (which I snagged on sale a while back). I swapped out the text that it came with for "Second Grade" using Leon from 8 Claws and a Paw. LOVE this font! And she's off! Annaliese is so ready for school to start. I'm just praying for another great year for my beautiful and intelligent growing girl! 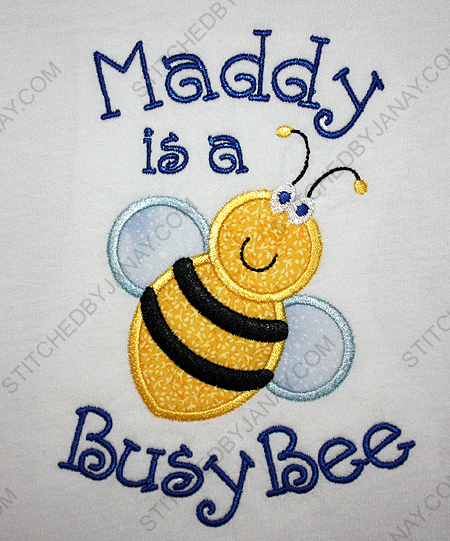 I used Lynnie Pinnie's Bumble Bee applique design, and added "Maddy is a Busy Bee" with Swirley from 8 Claws and a Paw. Love that font! 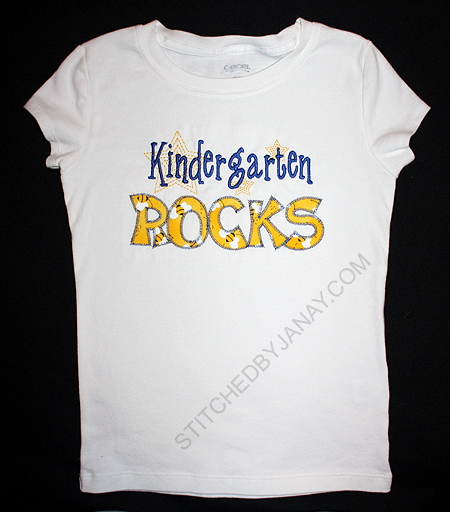 The second is a Kindergarten Rocks shirt. 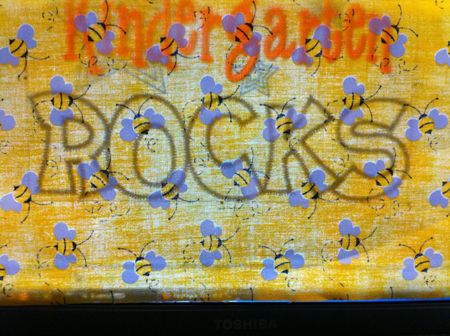 I used bee fabric and blue thread so that it's full of school spirit! 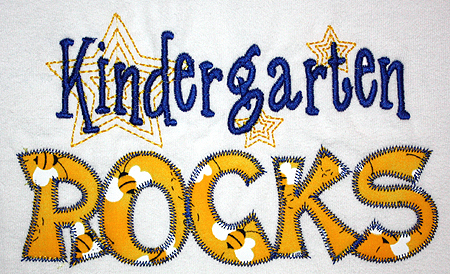 The original "Kindergarten ROCKS" design is from Embroidery Boutique. 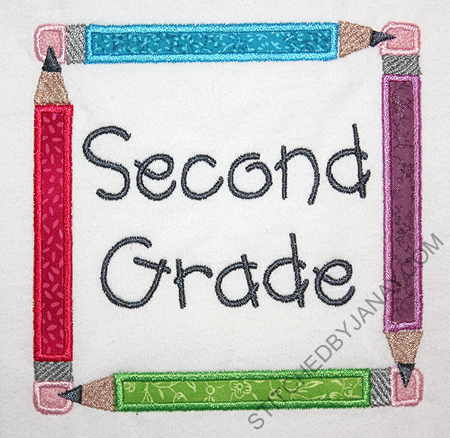 I used the stars and the word Kindergarten, but swapped out the applique word for the zig zag version of EB's Cade Applique Alphabet (with EB's blessing). 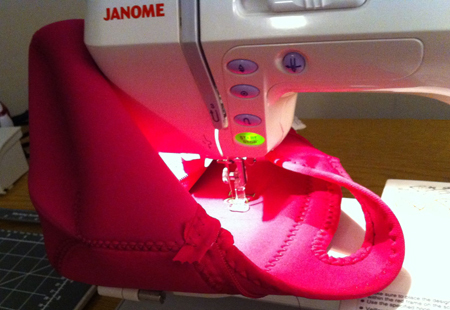 I thought I'd take a moment to give you a little extra insight into my creation process. 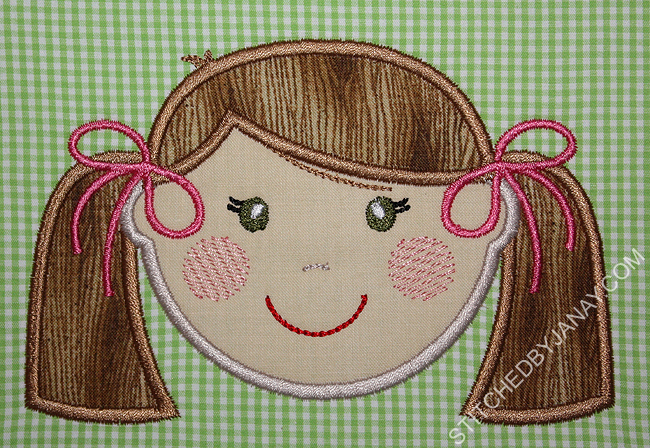 Often when I'm using a fabric with a motif I want to be sure certain elements are visible withing the applique area. In the case of this bee fabric if I simply laid it down, it's quite possible that no bees would be visible (Like the "K" above). 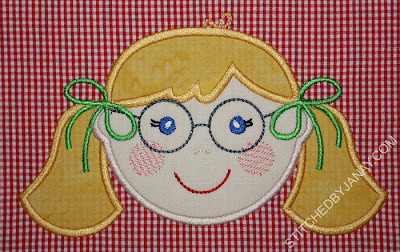 To avoid that I bring the fabric to my computer and lay it over the screen with the design image in the background. I slide it around and rotate it until I find the perfect position for the fabric, then use my water-soluble pen to mark how the fabric should align with the placement stitches. My goal was to get a bee in the wide parts of the R, O and C. I achieved that goal, and it's very close to my preview image! 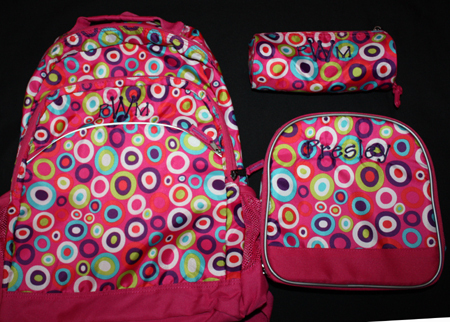 Nicole found this cute set at a Children's Place Outlet store. 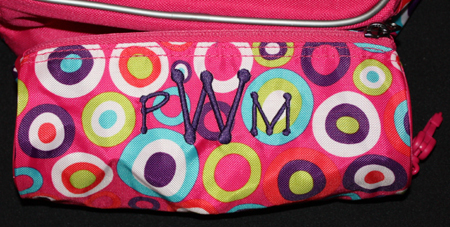 I figured I could monogram the back pack and pencil pouch, but immediately said no to the lunch box -- it is very well insulated and I didn't think my machine would handle it well -- not worth the risk. Then I realized I could take it along with me to IL and monogram it on my MIL's 6-needle machine! 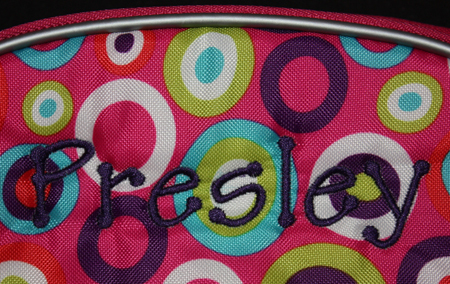 Presley wanted her three-letter monogram on the back pack and pencil case, and name on her lunch box. I used Tinker Toy from 8 Claws and a Paw for both. Here's a close-up. 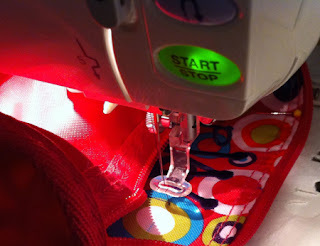 See how close that zipper is to the needle if I'm not holding it back? This is why you have to hold your breath the whole time! I used Swirley from 8 Claws and a Paw for their names. Here's a pic of embroidery in progress. Sticky stabilizer makes it possible, but again, holding my breath! Can't really tell if it's centered and straight until it's done. Eep! 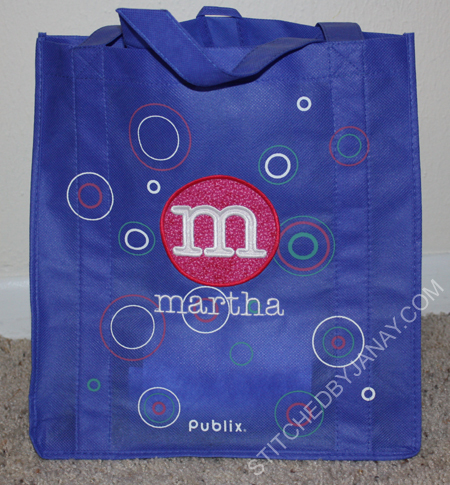 Ok, I think that does it for school bag monogramming this year. Thankfully Annaliese's backpack from kindergarten still looks fantastic even after 2 years of daily use, so we aren't shopping! YAY! 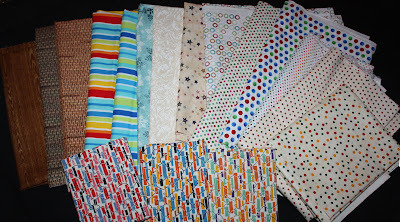 The batik remnants were $6.98/yard, but the rest were $5.98 a yard. I could have spent an hour digging through all the tables. I did peruse it for quite a while and found some gems. Love getting fabric for $6/yard instead of $11-12/yard! Here's what I brought home, I thought I did a good job containing myself! It was all remnants except for the Christmas Dots, the pink w/dark pink dots, and the basketball print. 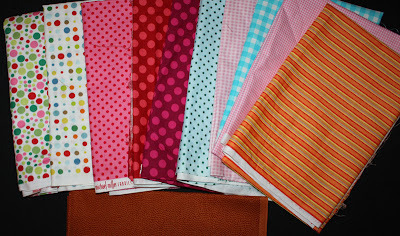 I love dots, ginghams and stripes! 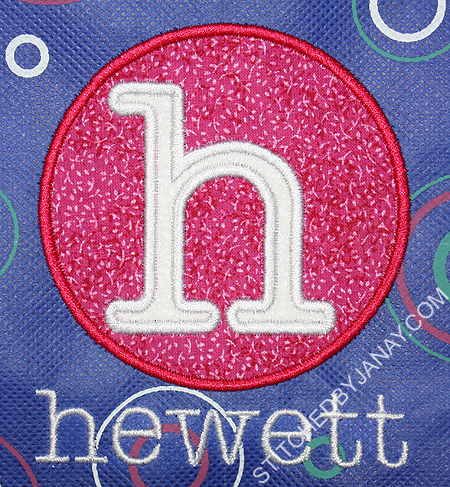 Won't this fabric look awesome in basketball appliques?!? It was pricey, but I could resist. There were two things that helped me not go nuts in Hancock's of Paducah. First, their minimum cut is 1/2 yard. If I could have gotten 1/8 or 1/4 yard cuts, I might have gone a little crazy. But my budget just doesn't allow for $5.49 and up for half-yard purchases. 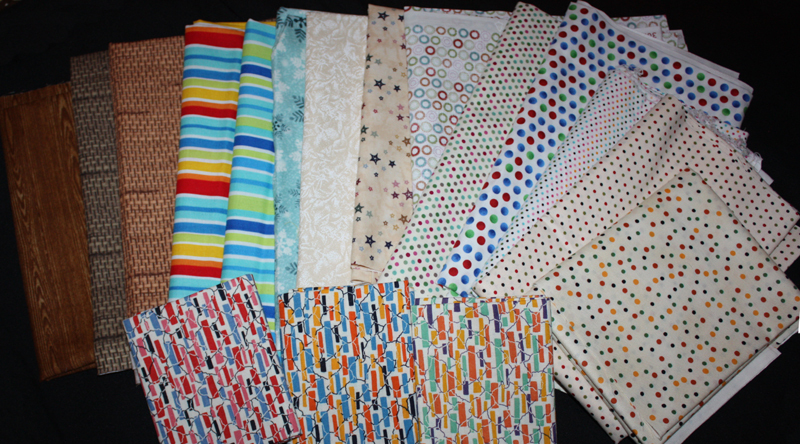 The other thing that helped me tremendously was that I had gone fabric shopping in my MIL's sewing room the day before. :) Look what she shared with me! Fun textures, stripes, and more dots!